I love this easy, fun, and healthy Halloween snack idea! Kami has a fun candy corn printable on her site that is just the right size and shape to cover a Laughing Cow cheese wedge. 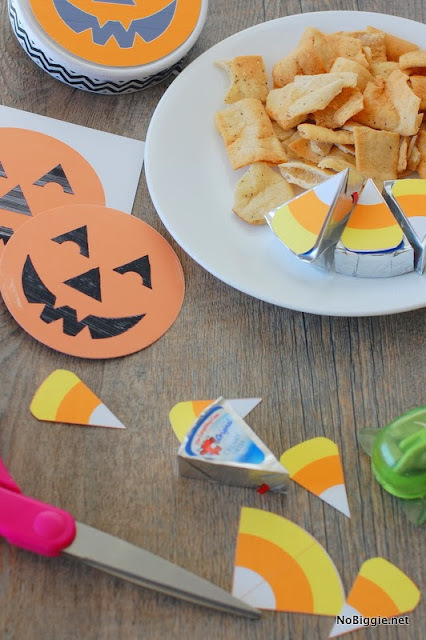 And just like that your regular crackers and cheese become fun Halloween crackers and cheese! This would be such a simple way to add a little Halloween fun to snack time or to your kids lunchbox! You can download the free printable to make this fun Halloween crackers and cheese snack over at No Biggie.